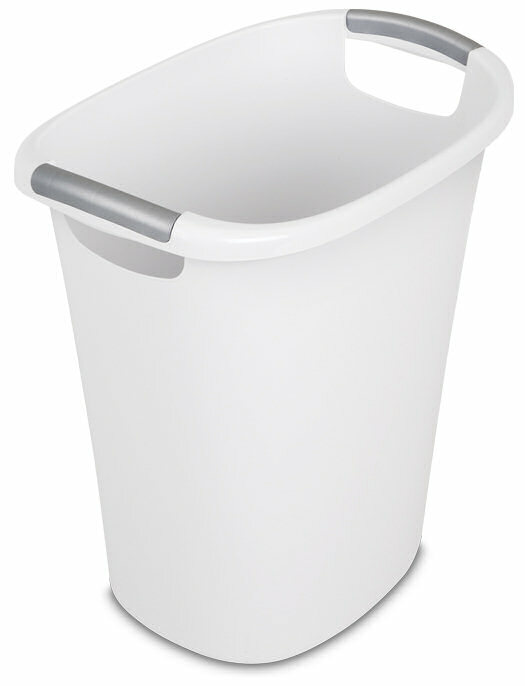 6 Gallon Ultra Wastebasket is rated 2.4 out of 5 by 5. Rated 4 out of 5 by Kquilter from Hard to fit bags, but serves it’s purpose This is a good sturdy garbage can. The handles kind of serve no purpose because most of the time you don’t have to carry a garbage can around and it makes it hard to fit the garbage bags, but it serves it’s purpose just hard to find bags that fit. Rated 4 out of 5 by mel98942 from Sturdy and good size for bedroom I really like the size and quality of this garbage can. It has easy to hold handles and looks and feels nice. Great for any room in home but use in the bedroom and works perfect. Rated 2 out of 5 by PhilM from Not shaped right for bags As a 6-gallon wastebasket, the label indicates suitability of 8-gallon/30 liter bags: but the mouth is too wide to accommodate 8-gallon bags. So you have to use standard 13-gallon ones. Cheaper, yes, but more wasteful -- the bag isn't full when the wastebasket is. Good size, but poor design. Rated 1 out of 5 by Target Shopper from Very poorly designed handles break easily. I bought 4 of these about 7 months ago. The handles for two of them have already broken as the plastic connecting them is ridiculously thin. Sorry Sterilite but a waste basket like this should last more than a few months. Rated 1 out of 5 by Harv from 10.5 Gallon is not a wastebasket to use with bags!! 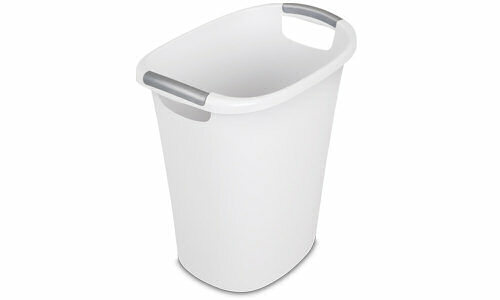 This product, 10.5 gallon wastebasket, says you use 13 gallon bags - but that is wrong!! Because the two lip handles are protruding so far out, you have to STRETCH the bags over the handles and that causes the bags to tear!!! I purchased the GLAD Force - Flex 5X's stronger bags and they tear too. Who keeps a receipt when they purchase a wastebasket?? If you use it without a garbage bag, it may be a nice basket but do not buy it if you intend to put a liner in it - you will have to purchase the 32 gallon bags!!! I am totally disappointed and would not recommend it.